Where can I preview my support request forms? I would like to know how I can preview the ticket form my customers need to fill in before contacting us. 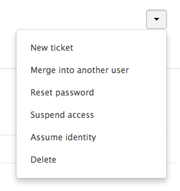 A ticket form is a set of predefined ticket fields for a specific support request. To see your ticket form, click the Admin icon ( ) in the sidebar, then select Ticket forms. Only ticket fields that are editable for end-users will be displayed in the request form. To change the order each field appears in the form, you can simply drag and drop them in the desired order. Note: Customers on the Essential and Team plans have access to a single ticket form. Professional and Enterprise customers can create multiple ticket forms. An administrator can take on the credentials of an end-user to view and use Zendesk Support as that end-user. This allows you to visualise what an end-user would see when creating a ticket using your request form. Search for the user you want to assume or select the End-users category and locate the user. Click the User options menu in the top right, then select Assume identity. In the Help Center, click Submit a request. Where is the submit a request ticket form in Help Center? How can I find out which of my ticket forms are using a specific ticket field?